Betsson sportsbook is an amazing way to bet on your favourite sports. On this web site you’ll get great graphics, plain interface and really big winnings. Over 4,000 betting options allow you to choose whatever you like and win ever more. 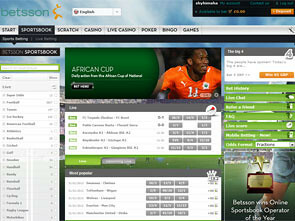 Betsson support over 20 languages and work with 7 popular sports betting currencies. The popular eGaming awards have been including Betsson to 10 best sportsbooks for several years already. If you decide to bet with this fantastic system, you will get a great choice of popular sports like football, tennis, ice hockey, athletics, basketball, cricket, golf, snooker, handball, formula 1, boxing, cycling, volleyball, rugby and many other options. 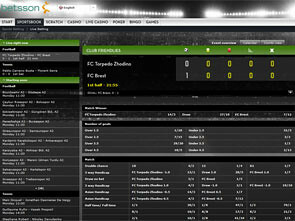 Also, you can bet during the most popular championships like Olympics, Euro 2012 or other major tournaments. Browse their full choice, and you will surely find something you like. Betsson suggests the players from different countries to get special promotions. Usually, the bonuses are awarded to newly registered users. Currently, this site gives interesting offers to sportsbookers from Denmark, Norway and Germany. Danish players can get up to 750 DKK Bonus Cash. Norwegian players can get up to 1,000 NOK for the first three bets that lose. German sports fans can get an interesting match bonus of 50% up to $75. If you are from other countries, you can ask the 24/7 helpdesk if they have any upcoming promotions for you. Also, all sports fans can get the magnificent bonus points at Betsson. They are awarded depending on the sum you played through in the casino. Don’t forget to check the wagering requirements you need to meet before withdrawing the money you got as bonuses. You need to make several easy steps to start betting at Betsson sportsbook. First of all, register a new account. For this you will have to indicate your full name, birth date, address and other miscellaneous info. Then you choose a username and password, confirm the registration and finally start the game. Don’t forget to claim your bonus if you reside in a currently eligible country. You can also use their mobile betting instrument to make your bets right before the TV screen, or to find out the freshest scores. 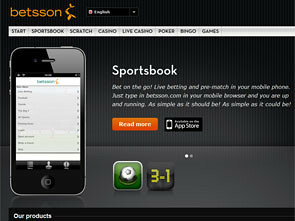 For this you simply need to go to apps.betsson.com and choose the option you need. Choose the platform of your mobile device: iPhone, Android, Smartphone. Choose the language and your country of residence. Enter your mobile number and the security code on the screen. Download the app using the link you get in an SMS. Find the installed app, start it and make your first bets. Betsson have over 10 years of experience in the online gambling market, so they offer you a good range of banking options. You can deposit using Visa, MasterCard, Maestro, Wirecard, Entropay, Paysafe Card, Ukash, Moneybookers/Skrill, NETELLER, ECO, Clickandbuy, or Click2Pay. To withdraw use Visa, Speedcard, NETELLER, Ukash, ECO, Moneybookers/Skrill, Clickandbuy, Entropay, Click2Pay, or a Bank Transfer. The minimal deposit at Betsson is $10. The withdrawals can vary between $10 and $10,000. If you use bank transfer, you can withdraw as much as you like. 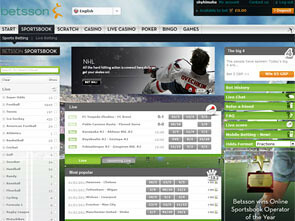 Betsson helpdesk is available in Live Chat and by email. You can also call them directly to +35622603000, but be aware that you provider can charge international calls. Also, you can find many responses on the FAQ page.